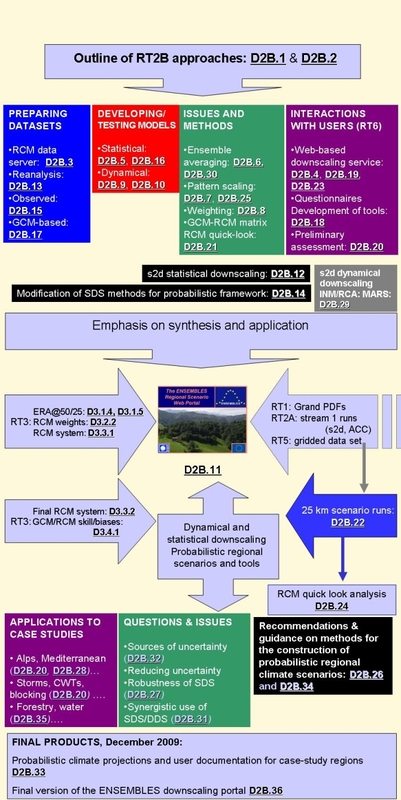 ENSEMBLES uses dynamical and statistical downscaling methods to construct probabilistic high-resolution regional climate projections and seasonal-to-decadal hindcasts. 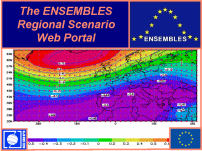 ENSEMBLES regional information: what, where, when? Developing new probabilistic methodologies and running new global and regional climate model (GCM and RCM) simulations is time consuming. This work therefore occupied much of the first four years of the ENSEMBLES project. Some preliminary downscaled projections were produced in 2007 based on outputs from earlier projects (e.g., probabilistic information for point locations based on combining PRUDENCE RCM outputs with a stochastic weather generator in a probabilistic framework). The ENSEMBLES RCM runs for 1950 to 2050/2100 at 25 km for the IPCC SRES A1B scenario are now complete and these outputs have been used to produce refined probablistic information at the gridscale and for point locations. The focus is on case-study regions including Scandinavia, the Alps, Mediterranean and Central/Eastern Europe (including the Danube basin), as well as Europe as a whole. This table summarises the statistically downscaled outputs produced by project partners and this report discusses the output formats required by users. The ENSEMBLES downscaling portal is available for statistical downscaling of seasonal-to-decadal hindcasts and climate change simulations to 2100. The move towards a probabilistic approach has prompted the research community and the IPCC to re-consider the use of terminology. Here, for the longer climate-change timescales (i.e., the 2020s and beyond), we refer to storyline scenarios, and probabilistic projections or information. We avoid using the term prediction for climate-change timescales, although it can be used, along with forecasts, for seasonal-to-decadal timescales. Since the start of the ENSEMBLES project, the term 'probabilistic scenario' is no longer considered appropriate (it is a contradiction in terms). Thus we try to avoid using it, although it does appear in some of the earlier ENSEMBLES material. This flow diagram shows the RT2B deliverables. Click on bold/underlined numbers to view completed deliverable reports.